A pair of unforgettable Manolo Blahniks for a very special Tuesday Shoesday-Matchbook Magazine arrives today! I hope you've carved out some time in your day to drool-this is sure to be divine! stunning! i would wear them with EVERYTHING! Gorgeous! Such a beautiful color. Would you come and visit me for a romantic tea-theme wedding? 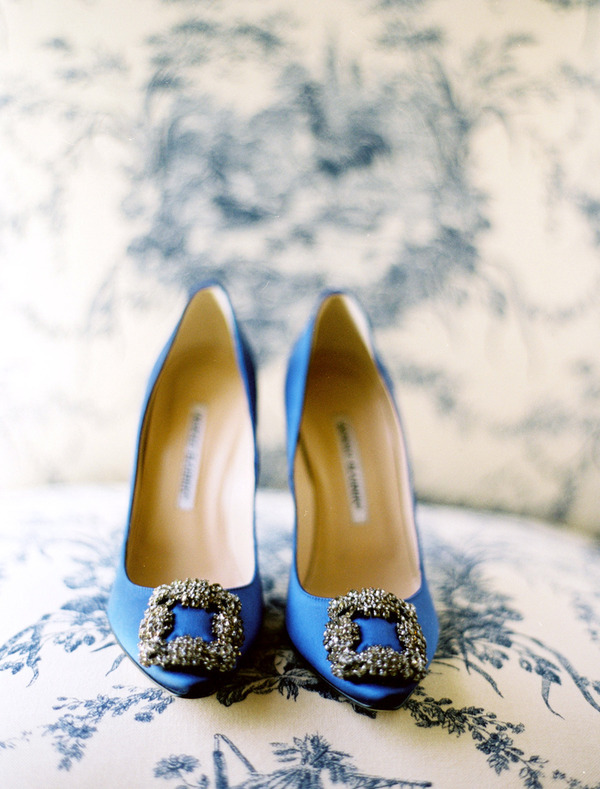 I have always been in love with blue shoes for a wedding. Stunning! My favorite color is blue ;)these are perfect and the pic is so beautiful!!! I think if I actually owned a pair I'd be too scared to wear them. I'm hard on my shoes. Even fancy ones. I absolutely love those! That blue is just gorgeous!! Those Manolo's always remind me of SATC the Movie... and can't wait to drool over Match Book today! I really wanted my something blue to be my shoes. When I told my step-mother-in-law about that, she said she was going to buy them for me. She didn't and that's okay because I loved the shoes I did wear but it would have been pretty amazing to sport these on my big day! they're even prettier against that vintage print sofa! I love this shoes. I really really really do! I think they are perfect and I'd love to wear them. these are very nautical to me? maybe its the blue? Maybe its the buckle? but I feel like these are the shoes Wendy should wear when wedding peter. they look as beautiful as jewelry! And what a dreamy shade of blue it is! blue is the new pink. I'm completely serious. Kayla, I love when you say things like that. I am going to quote you in very serious color discussions to come in 2011. If I could go back in time, I would wear blue shoes at my wedding. Seriously. you know I love blue, but these beauties were on my wish list and never ended up in my hands. sigh. gotta love Jose Villa too...double sigh.